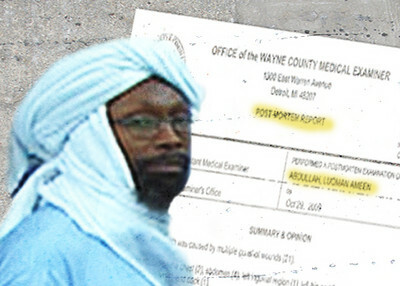 Authorities in Detroit released an autopsy of Imam Luqman Abdullah this week and its findings show his death was not pretty. Abdullah was shot 20 times, being hit repeatedly in the legs and torso and even taking a bullet through his scrotum as FBI agents tried to arrest him October 28 for a variety of crimes. The autopsy provides a detailed account and sketch of each wound Abdullah suffered. Not one shot from the FBI SWAT team hit him in the head. More than half hit below the waist. That point was somehow lost on the Detroit Free Press, which reported and editorialized that Abdullah suffered a head shot even though the newspaper posted a copy of the autopsy on its website. Agent Stejskal's and Agent Arena's analysis bear repeated publication. And Conyers had no business intermeddling in a matter such as this- what is the demographic composition of his District?